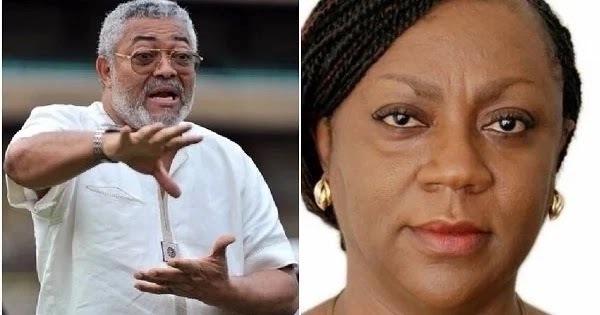 Former President Jerry John Rawlings has returned fire back on Valerie Sawyerr, a former Deputy Chief of Staff, over her recent vituperations against him. Mr Rawlings, in a comment, said like the proverbial mad person who took away someone’s dresses in the bathhouse, he would not descend into the gutter because Ms Valerie Sawyerr lacks integrity and therefore should be ignored. The former Deputy Chief of Staff in the Mills/Mahama administration attacked the National Democratic Congress (NDC) founder over what she described as disparaging comments he made against the current leadership of the party. In an article, Ms Sawyerr, whose father, Harry Sawyerr, served under Mr Rawlings, accused the former president of being in bed with the current President Nana Akufo-Addo by turning a blind eye to the shortcomings of the current administration. Mr. Rawlings is “still flogging a dead horse,” although the NDC is in opposition. Ms Sawyerr, who was Senior Policy Adviser and Head of the Presidential Delivery Unit in the Mahama government, suggested that Mr. Rawlings could not claim to be upright when it comes to corruption; and should spare the public his corruption sermons. “They say he booms … I say he buzzes … like an agitated mosquito … looking for his next victim. Again, he heads for other Heads of State … describing their governance as riddled with corruption. Is he trying to say that his reign was unblemished or that his twin brother’s (President Akufo-Addo’s) reign is unsullied? Really? Who born dog … in fact … who born monkey? “JJ oooo JJ … the great Papa JJ … the one and only Junior Jesus … the great saint who never does wrong … you are still flogging a dead horse … the NDC is in opposition, in case you have not noticed, while a living raging bull is moving around with reckless abandon destroying everything it finds in its path, including the assets and citizens of this nation,” she said. She said it would help the cause of the country if the former president directed his actions towards the ongoing fight against illegal mining (galamsey) or lead a crusade against the recent invasion of fall army worms and left the NDC to live its opposition life. Jerry Rawlings, in reaction, said such unprovoked attacks on his person could only be from persons without integrity such as Valerie Sawyerr. According to him, some NDC officials, including Ms Sawyerr, had resorted to criticizing him because they feel threatened by his integrity. “NDC is at the crossroads between those with integrity and those without. Those who lack it feel threatened by those of us who have the influence of integrity and that is what is frightening them. None of all these calls against us will hold. I mean it’s false, they know it, but they have to propagate it,” Papa J fumed. Rawlings indicated that the NDC lost the December 7, 2016 elections due to corruption scandals that rocked the previous Mahama administration, while hailing Nana Akufo-Addo.